Sometimes it's tough to date a bottle. There's been a lot of misinformation handed down, and taken for gospel, over the years. The early San Francisco directories are an invaluable asset for sorting out facts from fiction and they help to paint a true picture of the who's and what's of pre-prohibition western whiskeyana. Not long ago a bottle arrived here that I'd never run across before. It's a tooled cylinder fifth, clear with a very slight hint of amethyst, has a great strike and quite a bit in the way of character. OK, so it's not a California Clubhouse but it is, never-the less, a rare one. It's embossed Bibo, Newman & Ikenberger / Inc'd. / Teas & Wines / Cor. / Polk & Cal'a Sts. / San Francisco. Wilson mentioned it, with a dating of ca. 1893 - 1900. Barnett also has it listed, #46, with the same dates. If it was made for so many years, I wondered, why is it that there aren't more of them around? It took a little "digging" but the reason for the rarity of the bottle seems obvious once the pieces of the puzzle were put together. It would appear, despite some apparently conflicting evidence contained in the directory listings, that the bottle was probably only in use by Bibo, Newman & Ikenberger for one short year and change; late 1904 through April 18th, 1906. The first reference to Bibo was found in the 1892 Crocker S.F. directory. They were retail grocers who specialized in catering to the upper crust of "The City". Note that they were incorporated, but Ikenberg is not listed in the corporate structure. Rule the bottle out for this time period. By 1893, they were doing well enough to have a telephone; no small achievement back then. The name of the firm was changed to Bibo, Newman & Ikenberger in 1894. It appears based on the listing that they were now focusing on volume instead of an elite clientele, as reference to "fine" groceries was amended to just "groceries". And, there was no reference to wines. The listing also states that they were now located at the "SW cor. 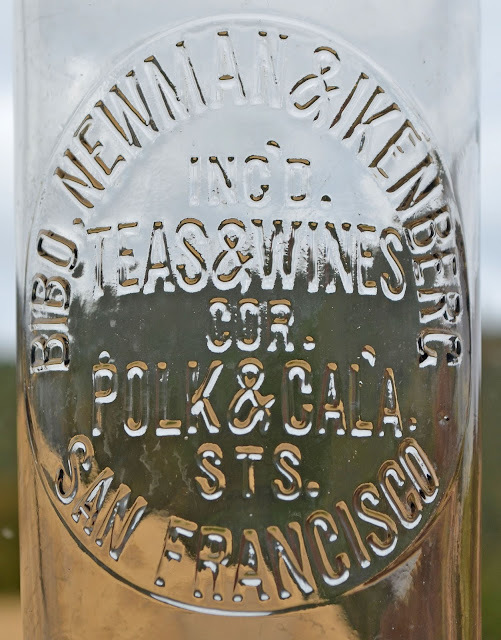 Polk and California", (the same address as that embossed on the bottle). Note that they are not listed as incorporated. Rule the bottle out for this time period. It was at this time that Samuel Bibo (Nathan Bibo's brother) entered the picture, although at first glance it appears to be unrelated. He is listed separately in the directory as a solicitor for the firm of Goldberg, Bowen & Lebenbaum, who were both wholesale and retail grocers, and liquor distributors. 1895 was pretty much the same, although a telephone number is now listed in the ad, but with a different number than before. Starting in 1896, all references to fine wines disappear and they refocus on home made California fruit specialties.They are now incorporated, but no reference to liquor; yet. For the next several years no changes were noted, although the reference to the telephone disappears. This was most probably a cost cutting move as the nation was gripped by a severe financial reversal (depression) starting in the mid 90's and continuing on though the very early years of the 20th century. Notice the association with Rathjen Bros. (wholesale liquors)? In 1904, the emphasis on fine groceries reappears, and we now see the first reference to wines, liquors, (and cigars). The listing is somewhat confusing though, as it shows first Bibo, Newman Co., dealing in "fine groceries, wines, liquors and cigars", (back to the upper crust?) followed by a second listing for Bibo, Newman & Ikenberg (just groceries), but at the same address. The same ad appears in the 1905 directory as well. Note; we now have the presence of "Incorporated", "Ikenberg", "wines" and liquor. Bingo! At roughly 5:13 Am on April 18, 1906, San Francisco would change forever. What wasn't destroyed immediately on California Street by the earthquake would succumb to the inferno which followed on it's footsteps. A few months after the earthquake, a relief business directory was published. Bibo, Newman & Co. are listed in this directory, but Ikenberg is conspicuously absent. And, it looks like Sam Bibo decided to give his brother a run for his money, as he is now a direct competitor located just a couple doors down and across the street. The financial strain must have been too much for the firm, as they disappear entirely from the scene after 1907. There is no reference to Bibo, Newman & Co., and Nathanial Bibo is listed simply as residing at 3719 Sacramento St. in the 1908 directory. Looks like a combination of bad timing, and bad luck (along with Nathanial Bibo) are to thank for a true rarity amongst western whiskies.